Is it advisable for you to lose weight? If so, what would be the optimum target weight? Check it here. David Fäh, PD Dr. med., conducts research and teaches at the University of Zurich, and is a lecturer at the Swiss Federal Institute of Technology in Zurich (ETHZ). As a specialist for preventive medicine and health scientist he focuses on the causes, consequences and avoidance of overweight. He scientifically supported the development of this calculator. Controlling your eating habits in a targeted way is much more effective and sustainable than any diet. Losing weight in stages of 2 to 3 kg is ideal for most people. Maintaining a stable weight between these stages assures success. Doing more exercise and conditioning your muscles play a significant role in the plan. Not only the scales are important but also your wellbeing. Informing others about your plan to lose weight increases your chances of success. A person who has had enough to eat buys food in the best and most sensible way. Give preference to the products our grandparents used to buy. Give preference to products with unobtrusive packing and without any special advertising. Give preference to products that have undergone little processing, or none at all. Give preference to products with just a few, well-known ingredients. Light products (apart from drinks) do not help you to lose weight. Eat minced meat that has been minced freshly from lean pieces of meat that you have chosen yourself. Buy packets of normal size as opposed to large ones. Bend down to find the good products. Very often they are at the bottom of the shelf. Serve food from large packets in normal-sized portions. Cook the food in a steam cooker or Römertopf (clay cooker) without adding any fat. Keep any food left over and warm it up later in the microwave oven without adding any fat. Fry eggs in a Teflon frying pan with a little mineral water, but without adding any fat. Use kitchen paper to dab off the fat from food that has been deep-fried or breaded. Remove the skin from fried sausages, or pierce it, so that the fat can come out. Cook chips and breaded food in the oven without adding any fat. Vegetable crisps: Cut into thin slices and leave to dry in the oven at 150°C. Fry meat hot but only for a short time, and then cook it in the oven for an hour at 80°C. Fry or deep-fry meat in an egg-piccata batter instead of using bread crumbs. If you are eating out: Order a menu with soup, salad and an extra portion of vegetables. Make popcorn only in a microwave oven - it hardly needs any fat. Only keep or eat food in the kitchen and dining room. Do not leave any snacks lying around in view. Clothes made of non-elastic fabric warn you that you have put on weight when they feel tight. Clothes made of non-elastic fabric enable you to see and feel whether you have lost weight. Arrange food in the fridge such that high-calorie food is on the top or bottom shelf. Throw food products away that have past their shelf-life, rather than eat them. Make sure to serve food that is already on the plate: Keep the pots, pans and bowls in the kitchen. A cool bedroom stimulates fat-burning during sleep. Cleaning your teeth directly after the main meals reduces the temptation to eat in between. Book a holiday hotel with half board rather than full board. Allow at least twenty minutes for each meal. Eat at the table and not whilst standing, walking or sitting at your writing desk, or on the couch. TV, mobile phone, computer and newspapers are taboo while you are eating. A wider choice of food means more enjoyment with less calories. Chew each mouthful until your tongue can no longer feel any solid particles. Do not put any more food on the fork until the last bite has been swallowed. Make a pause before the second helping. One then often feels one has had enough. Bitter substances slow down the digestion and make one feel full quicker. Soups with few calories satisfy hunger particularly well. Fast food: Eating a dürüm instead of a doner keeps your figure in better form. Less food tends to be more filling when eaten from small plates. Eat a plentiful breakfast and lunch, but cut back on snacks. Regular mealtimes help you to lose weight. For dessert, choose coffee and cheese instead of sweets and alcohol. Strongly spiced meals are filling and stimulate calorie-burning. The same amount of food is more filling in the morning than in the evening. Proteins are filling for a longer time than fats and carbohydrates. A large glass of water before your meal reduces your calorie intake. Sweets between meals stimulate the feeling of hungriness. Few carbohydrates in the evening stimulate fat-burning during sleep. Calories from starch (potatoes, pasta products, etc.) are filling for a longer time. Enjoy fruit preferably as a dessert rather than between meals. Fat with salt is less fattening than fat with sugar. Olive oil is filling and stimulates fat-burning. Butter can be spread thinner if left for a quarter of an hour at room temperature. Cut any visible fat off the meat and leave it on the plate. Food that is rich in protein stimulates calorie consumption. Fibrous materials together with large amounts of fluid are the most filling. Eat fibrous materials slowly as they do not feel filling until a quarter of an hour later. A balanced mixture of carbohydrates, proteins and fats is better than any diet. A varied intake of food stimulates the intestinal flora and thereby the calorie consumption. Alcohol is rich in calories and stimulates hungriness. Dried fruit is more filling if the fluid that has been removed is compensated by a large glass of water. If hungry between meals, drink something first. Tea is filling without calories. Spiced tea with cinnamon, etc., has a particularly good effect. It is better to eat fruit than drink it. Keep active even if you do not do any sport. Get up from your chair in the office more often, for example, when you are on the telephone. Bus: Get off one stop earlier and walk the rest. Do daily muscle-building exercises using your own body-weight. Fitness training at home: Skipping rope, rubber band, plastic bottles filled with water. In the kitchen and garden: Use manual instead of electrical devices. A pedometer is useful for measuring everyday movement. Stand in the train or bus, or when waiting at the bus stop, instead of sitting. Chewing gum consumes about as much energy as standing. Become fitter and burn more calories. Alternating between a hot and cold shower stimulates energy consumption. Physical exercise: Every day - this is important - anything else is secondary. Even at rest, more muscles burn more calories. Sport before breakfast is best for burning fat. Do not eat for two hours after doing any sport - just drink some water. Women burn the most fat in the second half of the cycle. Avoid sports drinks as they slow down the fat-burning process. Reducing the room temperature increases the calorie consumption. After going without sugar for two weeks, less sugar tastes sweeter than it did beforehand. Before taking a snack, check: Am I really hungry or is it a habit? Do not always satisfy your hunger immediately between meals, but wait a few minutes. Only eat between meals if you have felt hungry for longer than half an hour. Fruit and vegetable snacks fill the stomach with less calories. Keep up the target weight you have reached. Leaving out the evening meal now and again, stimulates fat-burning during sleep. Weighing yourself once a week is enough and reduces the frustration. 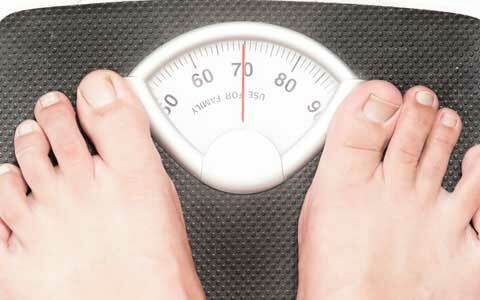 Weigh yourself in the morning with an empty stomach, after going to the toilet. Also treat yourself occasionally to one of your favorite calorie feasts. Keep calories low during workdays and loosen the reins on the weekend. After a relapse into overeating, nothing has been lost. Use these setbacks to learn from your mistakes and do better in future. Eat your evening meal earlier, then clean your teeth and do not eat any more snacks. Five calorie-free hours between the main mealtimes are ideal.